Word from TDEU: Aki Jones is not your typical athlete. Some might say he started playing football rather late, but, he reached his goals - he played in the NFL. But, what surprised us the most is his mindset of helping young guys in Europe. Coaching and hosting camps for high school kids is not something you'll see every day around here. Aki likes to say he wants to make football in EU better, and we can only add that he's making a huge impact on the game of football in EU! 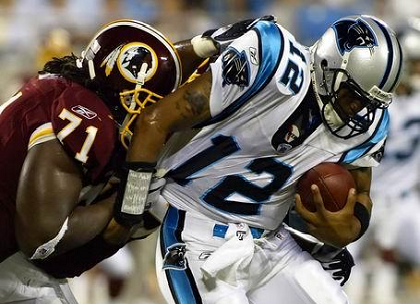 I played for the Washington Redskins for a year, back in the 2005. When I was done, I went back to school, I did some training for the combine and coached high school kids. In 2009. I came to Europe. It was a 3-4 year gap from my NFL experience to coming to EU. I was an undrafted free agent. I got signed because I was the best at the camp. Coaches said the best ones stay. I had to make sure I do everything right and to make it to the final cut. They didn't care what school did I go to, and me coming from a smaller school had to compete against the guys who came from Florida State, Uni of Iowa and so on. I just followed the directions and knew what I was supposed to do. I went out there knowing 31 teams didn't pick me, and I wanted to show them they made a mistake. During the whole pre-season that was the way I played. I played with the anger I had something to prove, which a lot of guys didn't have. My first game, during the time-out, I was standing there on the field and said to myself "Holy sh*t, I'm playing football!". That was the moment when it hit me - I'm getting payed to play football! However, finding out I have a back problem ended my career as a player. In the NFL they have all sorts of ways to get you back on the field as fast as possible, and I did get injections to make the pain go away - and it probably isn't the smartest thing to do. As a player you have to know what you're putting into your body. Sometimes it's not the best for the long time, but for the short time. I actually came to Europe to develop the game. I have a degree in marketing, and I wanted to help promote the game and attract more people. So it was more to do with my professional resume than football. 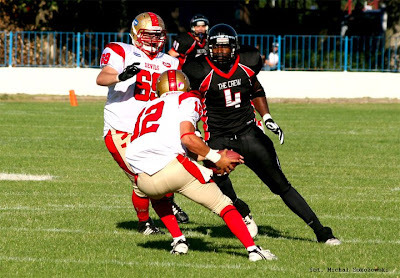 One thing led to another - and as a former NFL player, I had to play in Europe. It brought a lot of publicity to the league. The three years I was there I managed to bring some of the best players. Bringing well-known athletes from NFL and College level helped the game and brought more attention to it. I played for two teams in EU - the Crew from Wroclaw, and Worsaw Eagles. 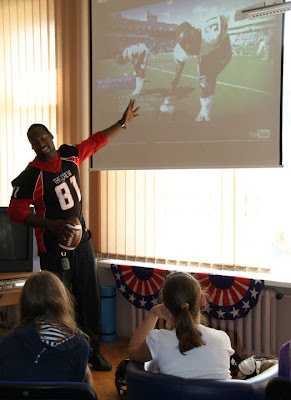 In Poland, I did football presentations, free football camps, going to high schools, and eventually got the high school kids to be interested in the sport. We started a high school league. It doesn't matter from which team kids would come from, everyone was welcome. I wanted to make the football better. After Poland, I went to Sweden. I knew a great coach there who already had a program for high school kids, which could even give them the ability to go to The States to play. It was really good! When I heard about it, I wanted to join, and spent 2 seasons there, with the Arlanda Jets. I really enjoyed it out there, they have great young players. It was a great experience. In Sweden everyone is pretty much fluent in English. Kids were already prepared to go to The States, they can speak the language. They're also on a team that plays international games. One of the linemen, he actually got a scholarship in USA and ended up being one of the best offensive linemen as well as D-linemen in Chicago. There are so many kids that are talented like that in Europe. Once they play with the National Team, or go to Texas for the World Tournament - they can see they can really do that. They just need to prepare themselves to get there. We help them to reach their goals. A lot of guys in The States didn't played football when they were really young. Me personally, I started when I was 15. I was playing basketball. In The States every school has to have a sports team, you have to play. In EU, it's not like that, kids can just go home and play video games. I'm trying to teach the kids in EU to be active. When we started training kids, in most places we had to teach them how to run straight. That's the main difference - the culture of being an athlete and what just being an athlete. Then you teach them how to be a football player. It's different coaching the kids. If you push them too hard - they can say "I don't want to do it". There's nothing really in it for them. Just to be a good athlete? On the other side - there are kids who are just competitive and like new things. I had these three kids who played volleyball. Never played football before. Now, they're 18, one is QB, his brother is the best WR - they fell in love with the team aspect of football. Guys coming together to practice, and sometimes, guys just want that brotherhood - family kind of an environment. First thing you want to teach these kids is the team work. It's not all about you, it's about the team. When you get that into their heads - then it's easy to say - alright, this is how your position works. NOT SHOWING UP FOR PRACTICE! I think every import will tell you that. We had 3 practices per week. Guys would miss two, and show up for 1. When the game comes - they won't know how to play. Guys who show up at 1 practice would usually say they're tired, or their leg hurts. If you want to play football... I had to practice every day not matter how I felt. The biggest mistake is that they can play whenever they want. They have to come to practice. I'm not sure if I'll play in 2013. There are actually few things I'm doing right now. If I do play it will probably be back in Sweden. What we set up there - I want to make sure I finish that path. Wherever I go, I want to leave the kids with something better. 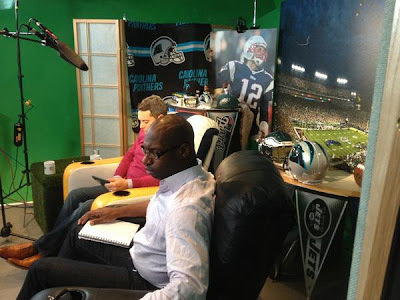 When I was home last time, I did a program with the NFL. They had an opportunity for former players to come out and work in the international offices. I took advantage of that, and went to the London office, where I could see how they deal with international sports marketing. Besides that, I'm working on projects on how to get the kids from primary schools involved with football. NFL Europe is not coming back. They're thinking more along the lines of bringing football teams from the NFL franchise to London, rather than having the whole NFL Europe league. Towards the end of the NFL Europe league - it was pretty much NFL Germany, since 5 teams were from Germany and one from Amsterdam. NFL now just supports IFAF, and that's how NFL works internationally. It's more about funding. For the most part, they're trying to get equipment to the teams. You could buy shoulderpads in USA for 50 dollars. Germany has a lot of "left overs" from the NFL Europe - blocking tools, bags, machines and so on. Their players can develop faster. Eastern Europe on the other hand - I can say that people there are very, very creative! I heard they make their own blocking shed and started selling them. I'm surprised it hasn't been done across EU yet. There's a whole league in Sweden. The girl QB for Stockholm Mean Machines is 17, and she can throw better than guys her age! I think she played with guys when she was 15 because she was that good. Women's football is developing, but I'm not sure how long it's going to last because it's hard to get that many women to join a football team. They need more games also. In order to gain experience, you have to have more games. There has to be more participation. On the other hand, how can you tell a woman to play a sport which has been promoted as a man sport. How are women going to feel about it? However, in Sweden we even had couple of the girls to play for the U-17 boys team. It's harder to find women in their late 20s or early 30s who would try a new sport. They're not even there so you can make fun of them. They don't have to do much. It's a great lifestyle! Nobody really messes a lot with the kicker, since, you don't want to mess with his head. So, you'd let them do what they want to do. Coming to EU wasn't a big deal when it comes to lack of equipment or good fields. I knew where I was headed and I knew I wanted to come and make it better. The only thing I wasn't prepared for was the lack of committeemen to practice.